memories of my brother and me peering into small, rocky basins, watching hermit crabs scuttle along the sandy bottoms. However, in invertebrate zoology at the Oregon Institute of Marine Biology, an entire world was revealed to me in each of these pools. Beyond the sea anemones, crabs, and bright orange and purple starsh that I was used to spotting, I discovered an intertidal zone rich with pink coralline algae, cup corals, brittle stars, sea cucumbers, urchins, bryozoans, and more. I even found an octopus in one pool early in the course, a feat which astounded me. For a woman who’d dreamed of marine biology from the age of 11, this was heaven. Dorning’s journey with the ocean will continue next fall when she crosses it to attend graduate school in the United Kingdom. She is a winner of the highly selective Marshall Scholarship. 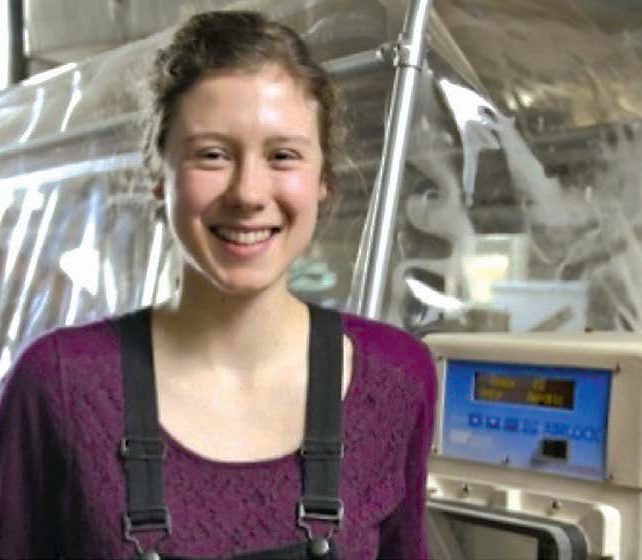 I arrived at OIMB eager to dive into research—after a year in a microbiology lab in Eugene, I felt eager to work more closely in my broad interest in marine ecology. My early research experience had already earned me an NOAA Ernest F. Hollings Undergraduate Scholarship, and I spent the summer of 2016 in Cape Cod, studying the acoustic behavior of whales. Before that, however, I developed independent research skills at OIMB by conducting an independent project that would become my honors thesis. 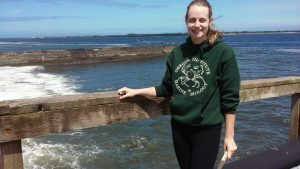 I had long been interested in studying marine species and ecosystems under threat, and I worked feverishly for two years to improve our understanding of how an invasive sea squirt, Botrylloides violaceus, affected the Coos River Estuary. In my time in the Young Lab, I learned to be a meticulous problem solver. In the field, I learned to be observant, and to speak with confidence about my work to those passersby who would ask, curiously, why I was lying on a dock and sticking a camera into the water. In Eugene, political science and biology professors inspired me to challenge my preconceived notions of science and its role in society so that I might work to reconcile clashing arguments among stakeholders in marine conservation issues. Through all of these experiences, I began to come into my own as a person, as a burgeoning scientist, and as a thinker. The best advice I received in high school was that I should make the most of my education, at any school I decided to attend. I cannot agree more. My time at the UO has been fantastic, and some of my greatest experiences and challenges came from the Department of Biology. Over the course of my junior and senior year, I took phenomenal courses in microbiology, microbial ecology, mycology, forest biology, just to name a few. All the professors invest an incredible amount of time in their classes, and the result is fantastic courses. I have been on field trips and mushroom-foraging trips. I wrote a research proposal and participated in a mock-funding discussion. I could probably plate bacteria in my sleep. Thank you to all of my professors. My time here has been just the best. I remember my first day at the University of Oregon like it was yesterday. It began with Deborah Exton’s general chemistry lab. Having graduated from an elementary school of 30 students, a middle school of 80, and a high school of 225, this single class was larger than all of my previous schools combined. Panic set in as I looked around me—my fellow students were already whispering about GPAs, medical school applications, and extracurricular activities. No sooner had I arrived than I found myself bolting from the lecture hall before class had even begun. 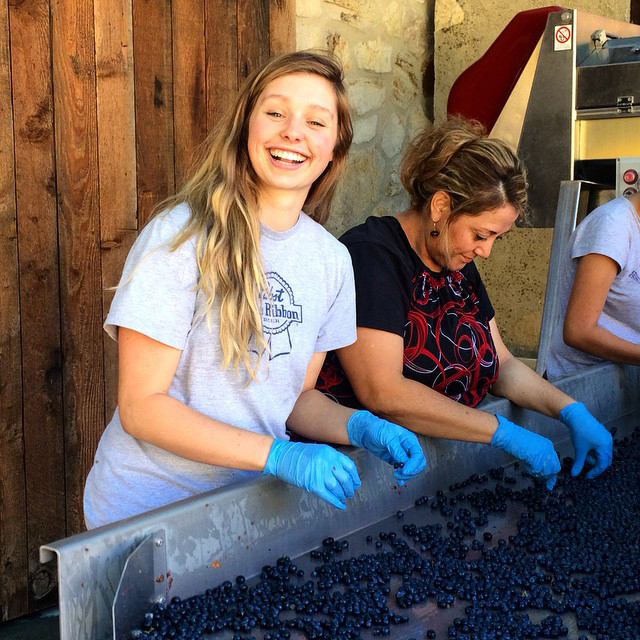 Isabelle sorts Cabernet at Kelly Fleming Wines in Calistoga, California. In that moment of panic, I questioned everything. Did I belong here? Could I succeed? Ultimately, I decided to postpone the chemistry sequence until my second year and enrolled in my first biology course at the UO. It was during my spring term that year that I took Biology 212. This class was notorious on campus for being one of the most difficult and demanding that biology majors were required to take. As the term progressed, I found that gene constructs, action potentials, and transpiration experiments became my life. I was accustomed to succeeding academically until this point, so when I received a C on my first midterm I was not only heartbroken, but also determined to succeed. In the end I did succeed, but not without the help of a group of 15 teaching assistants for the class. Having already taken and succeeded in Biology 212, they offered unique insight into study strategies and mastering the class material. As I turned in my final exam, I knew then that I wanted to become a teaching assistant and help future students just as I had been helped. For the three years that followed, I became a part of the Biology 212 TA staff. It was here, among a group of charismatic, determined, and intimidatingly intelligent group of individuals, that I found my place at the UO. In the years that followed, this group of people, led by instructor Mark Carrier, became nothing short of my family. With every passing year my love for the university and for Eugene grew exponentially. I came full circle from an overwhelmed freshman bolting from chemistry lab to a proud biology major and chemistry minor, ready to tackle any challenge that was placed before me. I joined and competed for the UO Equestrian Team, took a research-based neotropical ecology class in Ecuador, adopted a dog from the Portland Humane Society, and discovered my unequivocal passion for winemaking. It was this passion for viticulture and enology that led me to complete harvest internships at Schramsberg Vineyards. Having spent most of my life near the coast, it is little wonder that I became so intrigued with aquatic life. 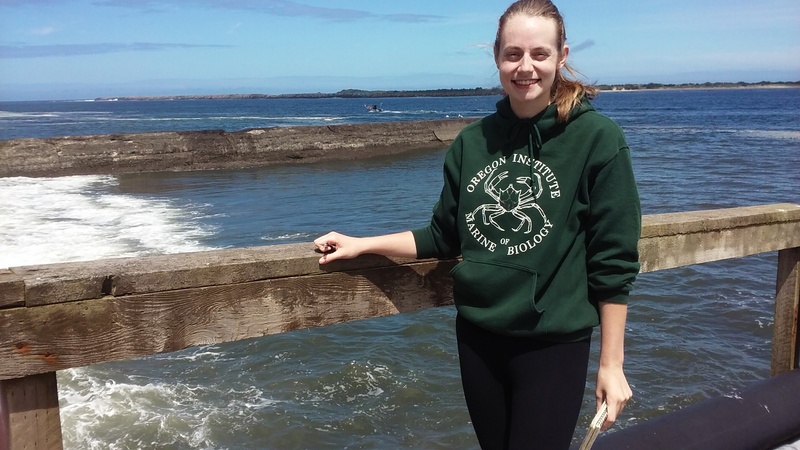 I doggedly pursued my passion for marine biology from the seventh grade onward, eventually enrolling at the University of Oregon after learning of their undergraduate program at the Oregon Institute of Marine Biology. My undergraduate years were spent exploring the various fields of the marine sciences, quickly discovering my particular interest for marine ecology and ichthyology. Towards the end of my third year, I went on to conduct my own experiment for an undergraduate thesis through the Robert D. Clark Honors College. The project involved investigating the homing behavior and site fidelity of the black prickleback, an intertidal fish found along the west coast, through tag and release methods. It was through my primary thesis advisor, Alan Shanks, that I was informed of an extraordinary research opportunity in my fourth year. John Postlethwait, from the UO’s Institute of Neuroscience, was searching for an undergraduate or recent graduate interested in doing research on icefish in Antarctica. I jumped at the opportunity, though not without some feelings of uncertainty and trepidation towards the journey and the nearly 6-month duration through the Antarctic winter. Excitement and curiosity trumped all other feelings in the end and shortly after the decision was made, I was on my way to Palmer Station, Antarctica. As part of the Postlethwait team, I was tasked with investigating the embryonic development of notothenioids, or icefish. These fish have evolved to survive in the cold Antarctic waters through specific adaptations, including reduced ossification of their musculoskeletal system. Some of the duties of my position included going on fishing trips on a large Antarctic vessel, maintaining the health of our stock, and collecting various tissues from adult fish. I helped collect and raise the embryos of these fish, sampling them at various developmental stages in relation to bone/cartilage development and the genetic factors associated with reduced ossification. 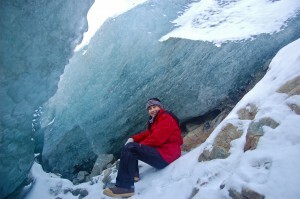 Of course, I also got to thoroughly enjoy the awe-inspiring scenery and wildlife that Antarctica had to offer! Since my return from Palmer Station, I’ve continued my position as a research assistant in the Postlethwait lab. I currently assist in the Fanconi anemia research, using zebrafish as a model organism for genetic regulation. Fanconi anemia (FA) is a rare genetic blood disorder that leads to bone marrow failure and cancer in those that inherit the defective gene from both parents. I run small molecule screens for compounds that can rescue this mutation in zebrafish expressing Fanconi anemia. I’ve learned a lot since I started, including the value of genetic research and model organisms in understanding human diseases. My first two years as a biology major were spent trying out the different flavors of science offered and working in everything from zebrafish to climate change labs. Evolution and ecology drew my interest, especially anything involving mammals, but for some time I remained unsure whether research was truly a good fit for me. Luckily, a simple summer data-entry task would set me on the path towards my current interests and plans to build a career in academic research. 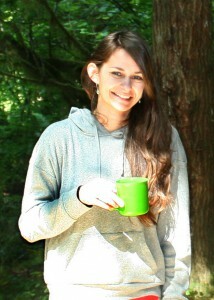 The project involved looking up mammalian sleep patterns for my Honors College and research advisor, Samantha Hopkins. Since we needed data for every mammal possible, I received a crash course in phylogenetics and massive Excel spreadsheets— two things I remain fond of, despite hours spent hunting down information and offset errors in the spreadsheet. I began working with Professor Hopkins again when I decided to study horses for my senior honors thesis. Together we designed the project where I examined several specific questions about the assumed relationship between “conformation,” or the external shape of the horse’s body parts, and its suitability for competition. This research helped me win a Goldwater Scholarship, which allowed me to spend my final year focusing on the thesis and other research projects. 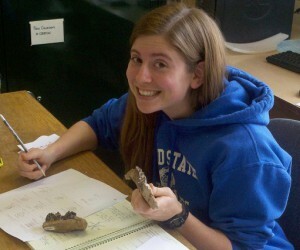 A side effect of working in a paleontology lab turns out to be a growing interest in paleontology. One of those projects included studying the functional morphology of fossil camels from the mid- Miocene (approximately 15 million years ago) of eastern Oregon. The paper from this work is currently in revision and will likely be published soon. I’m also very excited about several other projects that I hope to finish up and publish before I leave! In the Fall I will join the Department of Organismic and Evolutionary Biology at Harvard University as a PhD student and NSF Graduate Research Fellow. My proposed research will use my undergraduate experience as a launching point. I plan to build three-dimensional musculoskeletal models of horse legs to test modern performance hypotheses, as well as to investigate the adaptive significance of the evolutionary change from three toes to one toe. Three years ago, I came to the University of Oregon as a transfer student. I had been studying architecture but was more comfortable with my science classes, like engineering and physics. I was interested in their application of mathematic and scientific principles toward the resolu­tion of real-world problems. So, upon arriving at the UO, I enrolled in more science courses. My experiences since have helped guide my career choice and solidified my confidence in my decision. This fall, I am continuing my education in the doctor of pharmacy program at Oregon State and Oregon Health and Science Universities. My pursuit of a career in pharmacy was based, in part, on my fascination with life at the molecular level, like our ability to affect health through an understanding of biochemical processes. I discovered this fascination in my biology, chemistry, and hu­man physiology courses. My biology instructors, in particu­lar, provided knowledgeable and inspiring discussions about the molecular, genetic, and cellular processes of life that I find so intriguing. They showed me elegant, innova­tive experiments, sparking my appreciation for the creativity involved in science. Studying at an active research institu­tion instilled the value and excitement of continued intel­lectual pursuit. I learned about biology topics that are only now being unraveled, some­times from the very research­ers involved. During my second year, Mark Carrier encouraged me to work as an undergraduate biology tutor. I hesitated since I neither desired a teaching career nor enjoyed public speaking. Thanks to support and guidance from Mark, Holly Lynn, Jana Prikryl, and Alan Kelly, I took advantage of the great opportunity and participated in seven consecu­tive terms of tutoring. Aside from strengthening my understanding of science topics, tutoring has been invaluable for my communica­tion skills. Efficient communi­cation is of particular impor­tance to my health-care goals, whether in patient counseling or interdisciplinary collabora­tion. I need to be capable of conveying critical information in an audience-appropriate manner. Tutoring, which af­forded me the opportunity of speaking to my peers one-on-one about their goals and concerns in a class, as well as leading small and large group discussions on course mate­rial, was an excellent educa­tional decision. As a result of the program, I feel that I am a more patient and empathetic listener as well as a more experienced leader—and I know the reward of being able to help others. It has reassured me of both my ability and de­sire to someday participate in patient-centered health care.